In these energy conscious days, we tend to schedule when we are going to wax cheese. As you may know, all of our cheeses, except our natural rinded matured cheeses are hand waxed. This is quite a labour intensive operation and involves hand dipping cheese into pots of heated wax. These pots are held in a kind of large bain marie that is pretty expensive to run, hence, we decide the week before when we are going to have a ‘mad waxing day’. 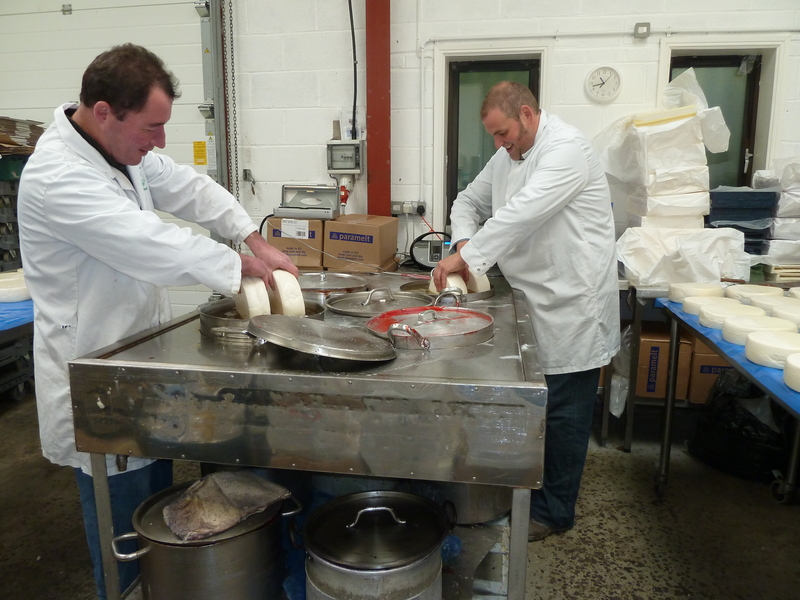 label and bag or prepare cheese to be waxed so that it is a seamless operation, without needing to stop. We have different pots for different colours and cheese types: smoked cheese is always waxed in brown, blue cheese in blue (strange, that,) and so on. Each cheese receives a clear undercoat and then top coats of whatever colour they go in. The wax bath comes on early in the morning, on a time clock so that it is melted before we come in, in the morning, and away we go! I think today, we have waxed something in the region of 200 cheeses which we have added to our finished stock in the cold room. Thought some of you may be interested in seeing us hand wax.